Polishology: It's beginning to look a lot like Christmas! you're right, it's beginning to look a lot like christmas! 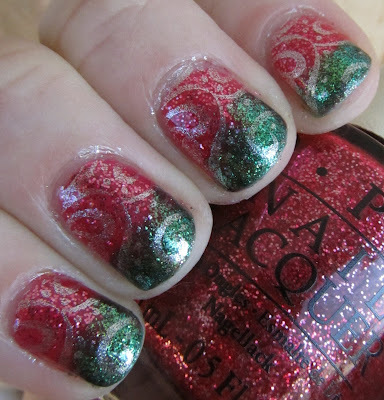 I've decided I'll be trying this for my xmas mani before going to family. Going to give this red w/ white swirls do a little while before I take on a sponge again. What do you use to do the sponging? Really great job! I have a work Christmas party next week and was thinking of doing something similar with red and green. :) The stamping really ties it all together! Hi! Discovered you from a post on pinterest. My daughter loves to do her nails so I know she will love your blog. Question I have (b/c I know she will ask! )-what are the "plates" that you talk about? I assume they are mini-stencils of some sort, but where do you get them? Lacquered Lady - For sponging, honestly right now I am just using little pieces from a basic household sponge that I cut off. I really want to get some cosmetic sponges next time I am at the store (and remember...) though, been meaning to try that.